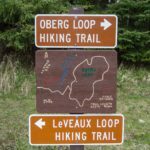 The Oberg Mountain Loop is one of the best day hike sections of the 310-mile-long Superior Hiking Trail. This trail begins from the trailhead with a short half-mile hike where you climb about 200 feet along a couple of switchbacks. Mud can be a common concern along this trail so, thankfully, boardwalks have been put into place in an attempt to keep hikers’ boots a little less muddy. At the top of the climb is a bench for you to rest or nurse if needed, but from there on out, it’s an easy 1.3-mile loop around the summit of Oberg Mountain. 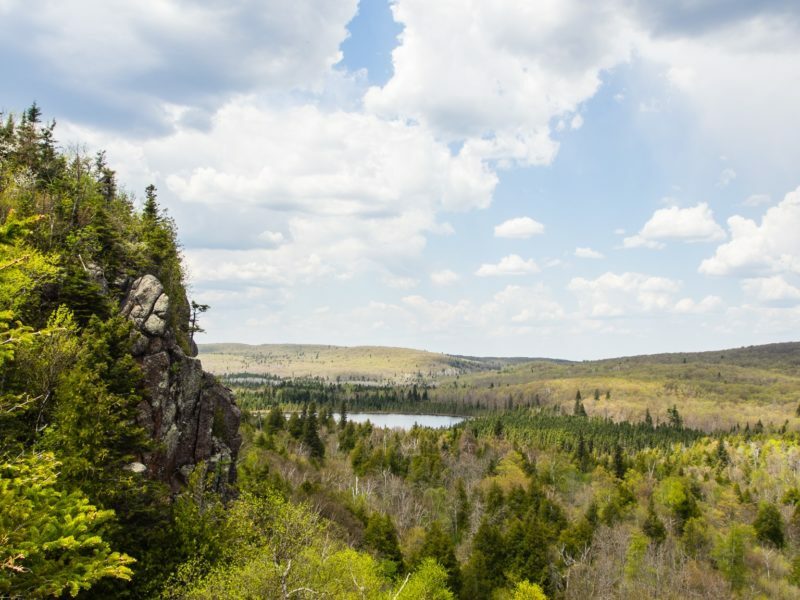 The trail features a series of eight overlooks, but it feels like you are seeing infinitely more as this hike provides almost constant breathtaking, sweeping views of one of the most scenic spots in the state of Minnesota. 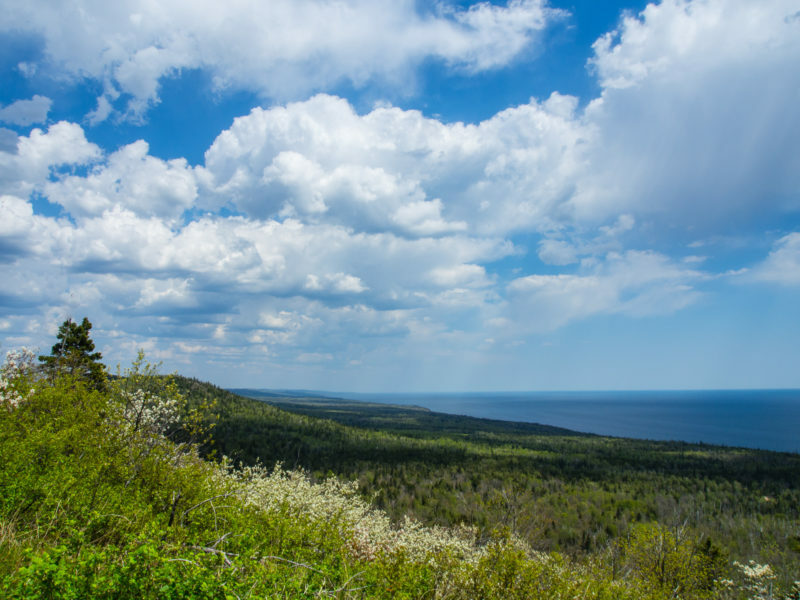 Highlights include Lake Superior, views across the rolling hills of Superior National Forest, and Oberg Lake nestled in the forest below you. Be cautious with young children on this hike as there is some steeper/more cliff-like terrain. You will want to keep small children close or in a carrier during those sections, but there is plenty of room to stay safely away from danger along the trail. Fall is definitely the best time to visit this trail despite the crowds. In late September, watch the Minnesota DNR’s Fall Foliage map on their website to time your visit for peak color. 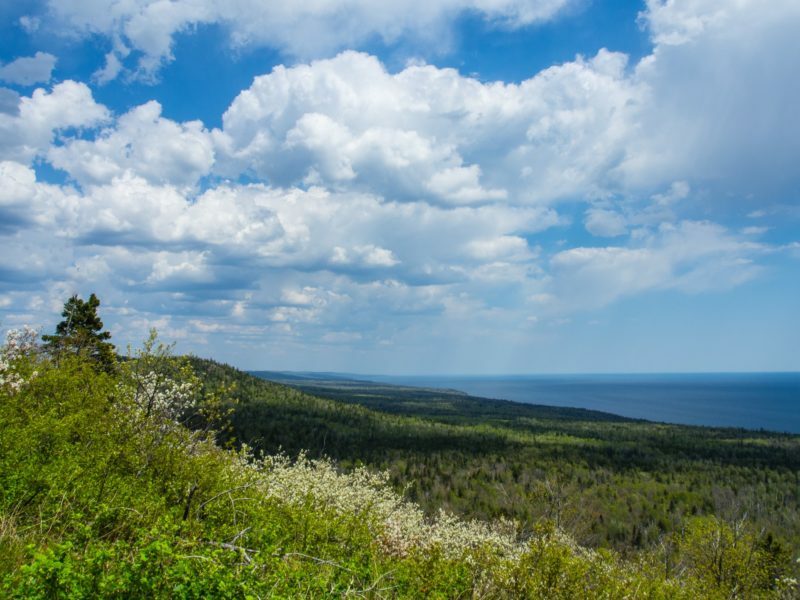 You can’t go wrong with a summer visit either as the bold green of the trees contrast strongly against the pure blue of the Lake Superior as you watch from above Oberg Mountain. In the winter, bring your snowshoes and you’re guaranteed solitude. 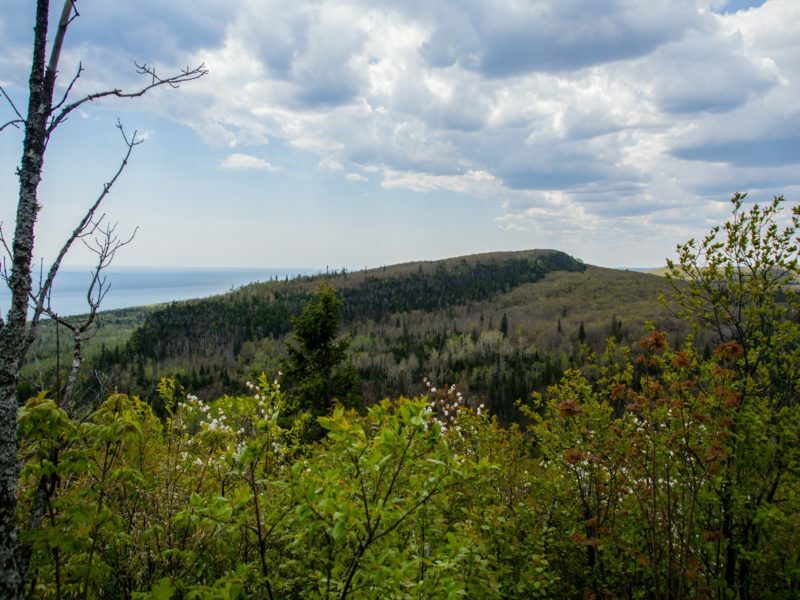 Trail offers a view of Lake Superior over the rolling hills of the Superior National Forest. Trail has benches at the top of the climb, good for nursing or a break! Great day hiking spot all year round. Oberg Mountain Trail is five miles east of Tofte, Minnesota, off Forest Road 336. Follow State Highway 61 five miles east of Tofte, and then turn north on Forest Road 336, also known as the Onion River Road. Drive a little over two miles to the parking lot on the left side of the road. The trailhead to Oberg Mountain is on the other side of the road.